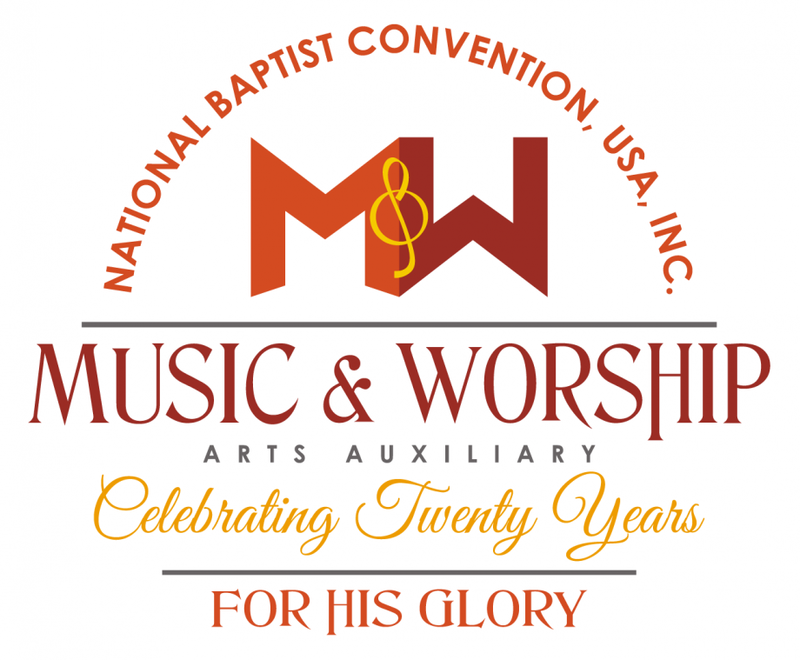 Welcome to the Music and Worship Arts Auxiliary webpage. We hope this page offers you the opportunity to see what is happening in our Auxiliary. We endeavor to offer you inspiring and helpful resources to advance your Music Ministries. We are excited to serve you. Visit often and watch God work! Grace and peace to you from God our Father and the Lord Jesus Christ. (Ephesians 1:2) We are beginning to rebuild our webpage to be a better source of contact with our constituents and others who visit. It is our desire to keep you abreast of what is happening in our Auxiliary and what is available to you. We are moving from merely dealing with delegates to becoming interested and involved with the total constituency of our Convention. We want our local churches to look to its national body for godly trendsetting, resources, assistance, and support. We must become contenders in the area of the worship arts, in today’s society. We exist for God’s glory and wish to assist our churches with all they need to worship our God and Savior Jesus Christ. Our auxiliary wants to begin to meet the needs of the church today. 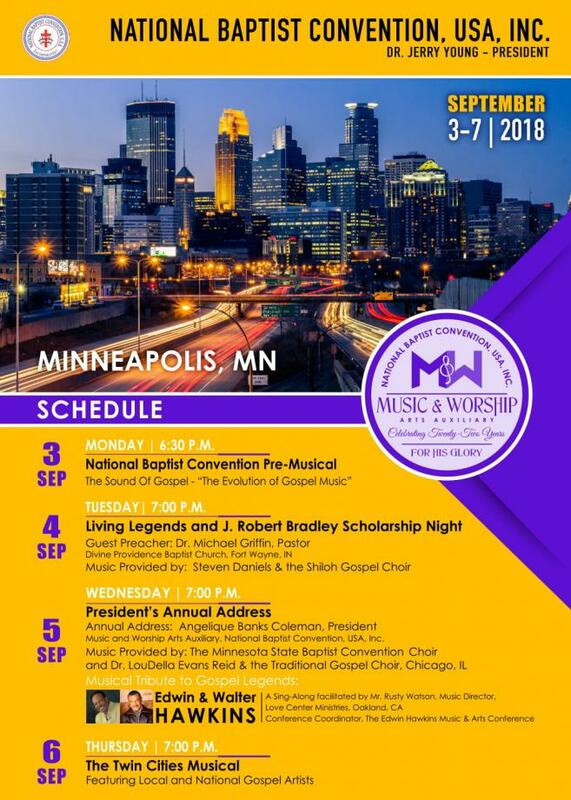 The new music ministries are including choirs, instrumental ensembles (band, orchestra, recorder choir, hand bell choir, etc. ), dance, mime, drama, and visual arts. Creator God has given talents and skills to His creation for His glory. We want our churches to look to us in teaching and training our constituents how to do this without perverting the gospel. Please also note that some churches are changing their music ministries to worship ministries that not only include the above, but also include audio-visual (media ministry) technology and taking the lead in everything else that takes place during the worship celebration (i.e. timing, logistics, traffic flow, etc.). Our Annual Session provides classes, seminars, workshops and panel discussions on a variety of subjects dealing with worship theology, methods, practicum, and cutting edge trends. Our instructors and directors are the best in their field. We bring in artists, not to perform, but to build us up, as worship leaders. It is a time for worship leaders to network, fellowship, and share with each other, as we worship together. We are called to equip (Ephesians 4:11-16); to build each other up (1 Thessalonians 5:11); to be cohesive, consistent and faithful to the task (1 Corinthians 15:58); and to be holy (Romans 12). We want to do that with your help, cooperation and participation. Stay in touch with us through our web page and Facebook page. Contact us with questions, challenges, and concerns in your ministry. Send us your concert, recording and/or anniversary information for posting. Need staff people for your ministry? Send us the job description to post. Looking for a position, send us your resume. Music And Worship Arts Launches NEW Pastors In Partnership Blog! The Music and Worship Arts Auxiliary is On the Move at Annual Session! I Live to Worship Concert CD Available Soon!